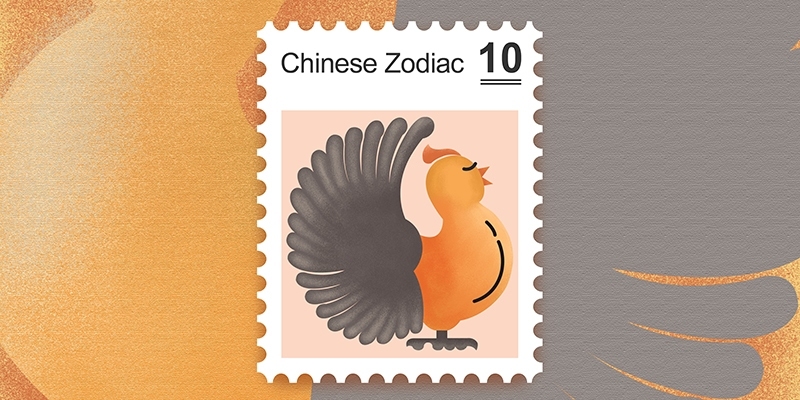 The 24 solar terms, based on the sun&apos;s position in the zodiac, were created by farmers in ancient China to guide the agricultural affairs and farming activities. The 24 solar terms reflect the changes in climate, natural phenomena, agricultural production, and other aspects of human life, including clothing, food, housing, and transportation. The 24 solar terms play important roles and have greatly influenced people&apos;s basic needs in life, and they still have an important function nowadays. 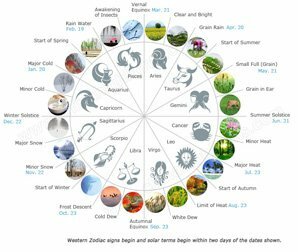 The terms consist of 12 pairs of major (sectional) and minor (middle) solar terms interlaced with each other., namelyThe 24 solar terms embody a complete circle of the sun and divide the circle into 24 segments, with each segment being about half a month long. 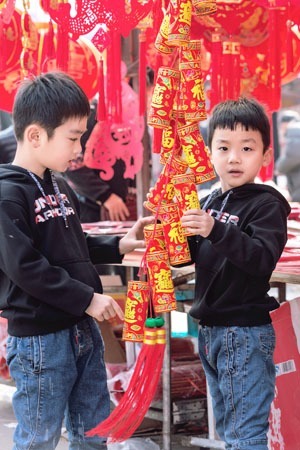 In both the lunar and solar calendars, the Gregorian calendar date of each solar term is basically fixed, with minor differences of within one or two days. 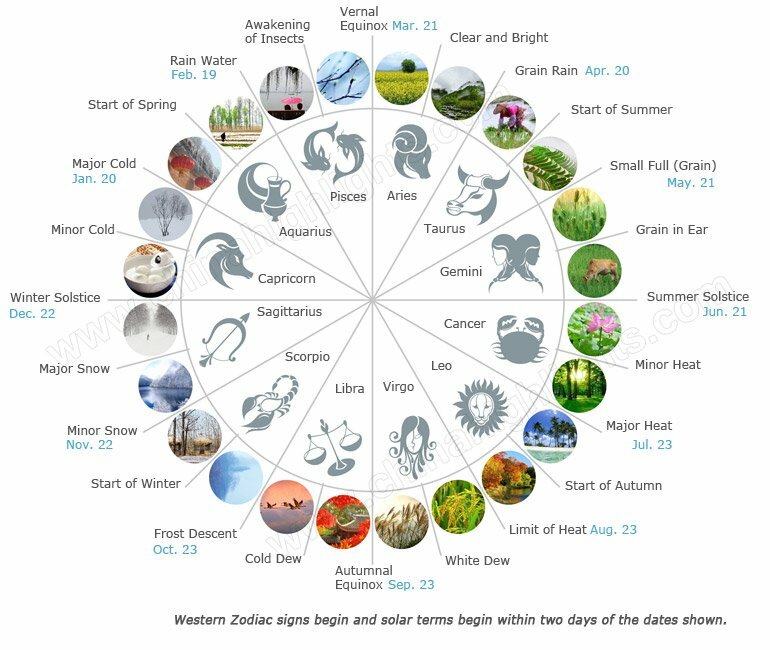 From the names of the 24 solar terms, we can see that the division of the solar terms has fully considered the variation of natural phenomena, such as seasons, climates and phenology. The solar terms known as Start of Spring, Start of Summer, Start of Autumn, and Start of Winter are used to reflect the change of seasons, dividing the year into four seasons of exactly three months. 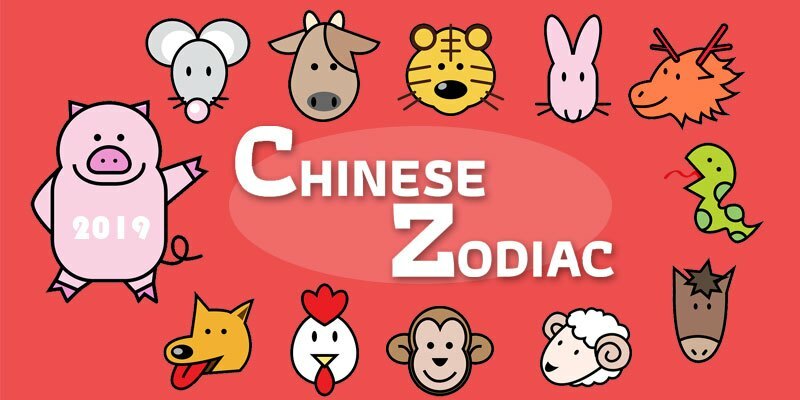 While this fits an ideal pattern of dates, it does not reflect observable reality in most of China. The solar terms of Vernal Equinox, Autumnal Equinox, Summer Solstice and Winter Solstice are divided from an astronomical aspect, reflecting the turning point of the variation of the altitude of the sun. Minor Heat, Major Heat, Limit of Heat, Minor Cold, and Major Cold reflect the changes of temperature in different periods. Clear and Bright, Rain Water, Grain Rain, Minor Snow, and Major Snow, White Dew, Cold Dew, and Frost Descent reflect the phenomenon of precipitation, indicating the time and intensity of rainfall, snowfall, dew, and frost. Small Full (Grain) and Grain in Ear reflect the maturity and harvest time of crops, while Awakening of Insects reflects observed insect activity. As early as the Spring and Autumn Period (770–476 BC), Chinese ancestors had already established two major solar terms, ri nan zhi (日南至 &apos;Sun South Most&apos;) and ri bei zhi (日北至 &apos;Sun North Most&apos;). As of the end of the Warring States Period (475–221 BC), eight key solar terms (Start of Spring, Vernal Equinox, Start of Summer, Summer Solstice, Start of Autumn, Autumnal Equinox, Start of Winter and Winter Solstice) marking the four seasons, were established according to the different positions of the sun and changes in natural phenomena. The rest of the solar terms were initiated in the Western Han Dynasty (206 BC–24 AD). Hence most terms refer to the climate of Xi&apos;an, capital of the Han Dynasty. A dubiously premature name, as it&apos;s not the beginning of spring in most of China; only in the extreme south. There is an increase of rainfall from then on. Thunder begins and hibernating insects wake up. With an equal length of day and night. It is clear and bright (when it&apos;s not raining), and the weather becomes noticeably warmer. A misnomer, particularly in southern China. The early crops show their shoots. The beginning of summer (in southern China). The seeds of summer crops begin to become plump, but are not yet ripe. The wheat becomes ripe; and the summer planting starts (in southern China). The daytime is the longest and the nighttime is the shortest of the year. The beginning of the hottest period. It is the time of year when the duration of the sunshine is the longest, the average temperature is the highest, the rainfall is the greatest, and the thunderstorms are the most frequent (in some parts of northern China). An anomaly: nowhere is this true. Like the "start of spring" it is about a month premature. The end of the hot summer. The transition from summer to autumn. The temperature drops sharply, and the autumn rains come. The weather becomes cold enough to reach dew point, but not cold enough to reach frost point. The weather becomes cold and frost begins to form (in North China). True of northern China, but winter comes later in the south. Snow begins to fall, the weather becomes cold. It snows heavily for the first time in the year (in northern China). The daytime is the shortest and the nighttime is the longest of the year. The weather rapidly reaches its coldest. &apos;Major Cold&apos; It is the coldest time of the year.